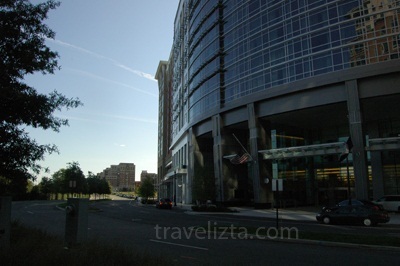 Renaissance Arlington Capital View Hotel by JW Marriott (4 star hotel, LEED Gold certified) located on 2800 South Potomac Ave, Arlington, Virginia 22202 USA, only 5 minutes drive from the Reagan Washington National Airport (DCA), and an hour drive by car or cab from this site to Washington Dulles International Airport (IAD). It situated in Arlington, near to Birchmere, Alexandria Presbyterian Church, and the Arlington Historical Museum. Tourist attractions also include Fashion Center at Pentagon City, the DEA Museum, and 20 minutes from Washington subway train (Metro) to downtown Washington DC, with multiple exits that makes easier to this metro station. The Metro service include destination to several tourist attractions like the White House and Capitol Building, also with this suggested route in visiting several memorial parks (by walk) starting with Washington Monument, World War II Memorial, Lincoln Memorial, and Martin Luther King Memorial with Franklin Delano Roosevelt (FDR) Memorial and Thomas Jefferson Memorial across the river as backgrounds set for photographs. 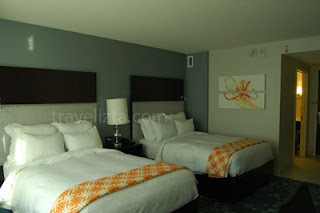 This hotel also provided shuttle buses service from hotel to Crystal city metro station for free. Recreational amenities at the Renaissance Arlington Capital View Hotel include an onsite indoor pool, fitness center which is fully equipped and provides free weights, cardiovascular equipment, treadmill, and health club. Other amenities include a round trip airport shuttle, shuttle to metro, and a cafe. The rooms at the Renaissance Arlington Capital View Hotel have elegant and modern wooden furniture and are air conditioned. The bathrooms provide complimentary toiletries, a shower and a hair dryer. The bathrooms provide bathrobes and a separate bath. Desks, ergonomic chairs, flat-panel televisions with premium digital channels. Guestrooms also feature refrigerators and bathrooms with shower / tub combination, and designer toiletries. Renaissance Arlington Capital View Hotel has been recognized as host for several international events, from summit to Climate Change congress. It offers a convenient on-site café, where guests can relax with a drink or two at the hotel's bar. It open for 24 hours service. The hotel also provides the added convenience of on-site dining. Guest room, include 1 king size or 2 double bed. Club include 1 king size or 2 double bed, and suite with 1 king size bed. High speed internet service is available by request (paid), and there's a free wifi in the lobby area. Club room level, $400/night, our discounted price $335/night. Get DISCOUNTED PRICE RENAISSANCE ARLINGTON CAPITOL VIEW Here!